Home Page > Family > Baby Love > Whoa, Baby! New babies are magical; the changes to Mom's body? Not usually. If your post-baby body includes dribbles when you sneeze, less enjoyable romantic dalliances, a looser look "down there" and more, it's time to consider ThermiVa. The non-invasive, pain-free treatment is also shot free, surgery free and delay free; you can resume intimacy immediately after your treatment. Have questions? Work with an all-female medical team so that the experience is comfortable from beginning to end. When experienced moms say, "It goes fast," believe them! After Baby is born, there's a period of physical and emotional adjustment that accompanies round-the-clock feedings and near-constant diaper changes. In the midst of the exhaustion, it's easy to forget those first magical months together. 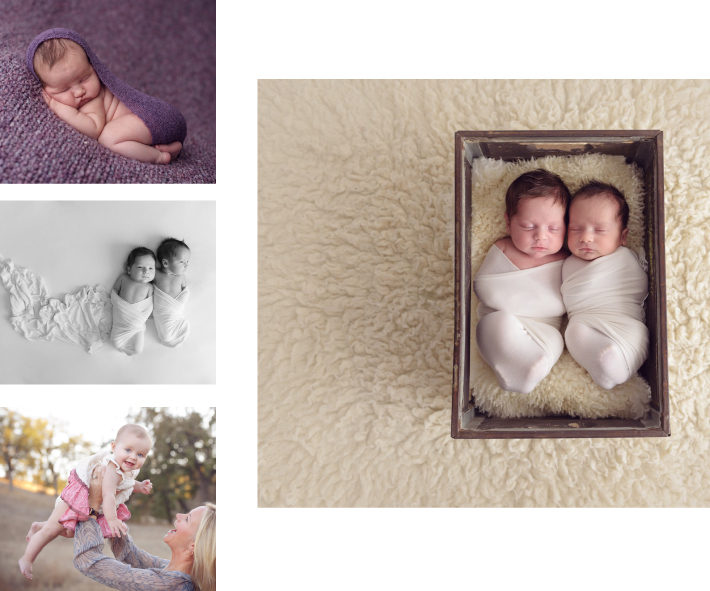 Newborn and family photography helps commit those moments to memory. Manya & Harout Nazarian welcomed these two beauties into the world this past December. Nothing makes us happier than watching our Inside SCV family grow. Here's an exciting new way to stay or get fit after pregnancy: take a Barre with Baby class! Bring your baby in your stroller to Golden Valley Park and get a signature Bella Barre class in the beauty of the outdoors - plus bonding time with your baby. The studio also added Prenatal/Gentle Barre, perfect for expectant mothers and those healing from back, neck or abdominal injuries/surgery. The team at Bella Barre pride themselves on keeping up with research and offering classes that keep you and your muscles away from stagnation. Choose from selections ranging from a sweaty, HIIT-style class to the zenful flexibility-building Barre Soul or their signature Barre Classic that blends the effectiveness of barre flowing movement to keep you heated. Want to check out the Bella Barre culture? Learn about free Sunset Yoga, group hikes and more by logging on. The best oral care for Baby starts even before they break their first tooth. In order to acclimate your little guy or gal to future-teeth cleaning, wipe their gums after each feeding with a wet, warm baby washcloth wrapped tightly around your finger. This simple task will soon make baby oral care habitual for both of you and significantly reduce the quantity of teeth-eroding bacteria and sugars in their mouth. Every parent hopes for a pediatrician that's more like family than "service provider," and for the last 19 years, that what Catherine Manuel, MD, FAAP has been to hundreds of SCV families. A resident of Santa Clarita since she was 7, Dr. Manuel loves practicing medicine in her hometown, combining old-fashioned service like house calls and "24/7" pediatrician access with today's most advanced medical knowledge and technology. Here are a few of her tips for preparing and caring for Baby! 1. It's smart to conclude the selection process for your baby's pediatrician before they're born. "After you give birth, you're recovering physically, you're exhausted and the last thing you'll have the energy for is researching doctors. Choose now so that you're confident and comfortable by the time your newborn is ready to meet their pediatrician," says Dr. Manuel. 2. Once you've selected your doc, stay with them. "Recent studies have shown that babies who've been treated by the same doctor during their first six months of life can be up to twice as likely to receive vital health exams before the age of 2," explains Dr. Manuel. "Lasting doctor-patient relationships allow everyone the comfort and connection to really focus on the long-term health of the child, not just immediate needs." 3. When it comes to choosing a pediatrician, balance services with personality. "There are many good doctors in Santa Clarita; we're very lucky!" says Dr. Manuel. "Choosing the right one for your family is more about preferences. Do you want a doctor who is in private practice, so that you can benefit from consistent, more personalized care? Are house calls important to you? Do you want to make sure you have round-the-clock access to the same physician? Do you feel comfortable asking this doctor questions and do you feel like your questions are taken seriously? These are some of the things parents need to consider before Baby arrives!"